Mercantile Bank of Michigan was founded in 1997 by Directors and Bankers who firmly believe that the customers, employees, and the communities they live in, are best served by financial institutions with local ties. 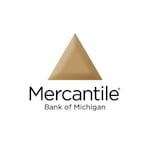 Mercantile Bank of Michigan offers a comprehensive range of products and services, including checking and savings, loans, business cash management, mortgages, investments, insurance, as well as online banking technologies. And today, as they look into the future, their belief in mutually beneficial relationship banking on both the consumer and corporate levels is key to strengthening the communities they live and serve. This personal focus will enable them to deliver their services in a way that truly sets them apart from their competitors. The mission of Mercantile Bank of Michigan is to provide value in a highly professional and personalized manner.